I still remember sitting in the middle of that shag green rug, my seven-year old legs feeling the tickle. I remember flipping through the pages of that tattered National Geographic magazine looking for pictures of fish for my collage when I came across somethings else. I remember bellies all bloated, eyes all wide, pleading with me. My heart shook, the earth quaked. Children were starving to death, the Ethiopia famine raging, the world just shifting their blind eyes toward it. Later, in nursing school, I would learn all about Eritrea and politics and all about mans inhumanity. I couldn’t understand it then…still can’t. And now again, STILL, children are dying. Still while my coffee budget is higher than the cost to sponsor a child. STILL while my gas to drive my children to lessons and to play at bright green parks greater than what it would cost to feed a child in the developing world. STILL while we buy ourselves clothes we don’t need and ANOTHER housewares item. STILL while people spend their money on outfits for their dogs for alcohol and for beauty treatments children are DYING. Still as I flip channels quickly when the images assault all my senses…STILL it hardly seems real. 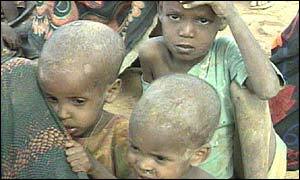 I want to do something about the drought in the Horn of Africa, the babies starving, now, today, in East Africa. Don’t you? Our youth group currently sponsors a village with World Vision called Garba Tulla in Kenya…it is hard hit, right in the midst of the drought. This project is just starting and needs plenty of support. And our government is DOUBLING whatever you donate. Or what about something proactive? What about buildings engineered to conserve water when it finally does fall? What about teaching young men about drought resistant farming? My friends are in the midst of this ministry doing AMAZING work. Won’t you think about sponsoring them for the next year? Help them design a future of hope so that our children aren’t using the world STILL a decade from now? USE THIS if you ever have questions about a charity. It rates charities based on all sorts of factors including administration fees etc. For your information eMi score 5 stars out of 5 on this rating system. In the event you need anymore motivation? You can watch this…I can’t. This entry was posted in Justice, World Vision by melissafed. Bookmark the permalink. I can’t even fathom how awful it is there! I feel so helpless to do anything for such an overwhelming situation, but I can’t stop thinking about it! Thanks for a great post about how we in America still don’t get the trials of the world. My heart (and future children) is in Ethiopia so I thank you for sharing the information with the world. I love how you offered concrete examples of how we all can help. Even sharing information is an important tool in God’s arsenal. Thanks. God bless. This has been on my heart too. Thank you. Especially for pointing people in a direction instead of just a lament.